Over the past few days, cash back at Dell has climbed to the highest in memory — certainly the highest in the past 15 months — and has now reached 20% cash back through BeFrugal (or 19% cash back through TopCashBack). This produces significant savings on a number of items across the site. We’ve got a few examples here where you can save a bundle on a large 4K TV or a professional DSLR, but there are lots of possibilities today. No cash back on special rate programs, including but not limited to: Auction@DellExchange, Donation@DellExchange, Dell Host, Dell Employee Purchase Program, Dell Small Business Systems Division, Public, or Corporate Accounts. Of you’re new to BeFrugal or any other portal, feel free to use our portal signup links with our thanks. Twenty percent back at Dell is great. As you can see in the 15-month chart above from Cashbackmonitor.com, until the climb over the past few days, the highest rate in the past 15 months has been 12.5%. A 20% cash back payout at a store that sells the range of electronics you can find at Dell is not common. Whether you’re looking for a computer to run your virtual reality setup, a DSLR to capture your summer vacation, or a new tablet/wearable/TV/etc, there are deals to be had. A couple of examples follow — though there are many more possibilities. You will receive the Promo eGift card via email in 10-20 days. Watch for the email. The gift card will be valid for 90 days from date of issue. Most gift card resale sites will no longer accept these for sale as they expire in such a short period. If you return an item bought with a Promo eGift Card, you will get a refund to that promo eGift card only if the gift card is still valid. If the gift card has expired (i.e. more than 90 days from date of issue), you will forfeit the value on a return and get none of the Promo eGift card back. In other words, be sure you want what you got with your Promo eGift card. You’ll earn 20% back based on the $397 price in your cart — meaning $79.40 back in your pocket, dropping the effective price of this 43″ 4K Smart TV to $317.60. If you value the $150 Dell Promo eGift Card at anywhere near face value, this is a solid deal on this TV. I don’t see it for less than $397 anywhere — combined with almost $80 cash back and the eGift card, you can’t really go wrong if that size works for your application. At $1097, this TV isn’t cheap. But 20% cash back means that the net cost will be $877.60. And that’s before the bundled $400 Dell Promo eGift Card. At $1097 before cash back and gift card, it’s already matching the best prices around according to Google Shopping. According to CamelCamelCamel, the price has never been lower than $1197 on Amazon. What’s more, as this is a discontinued model, so you might get lucky — if the price drops (at Dell or elsewhere) during your credit card price protection period, you might be able to get a refund of the difference in price. I don’t follow TV pricing closely enough to know if it’s a real possibility, and your credit card may exclude discontinued items from price protection — check the terms before you buy. Still, $877.60 plus the gift card makes this a pretty solid buy if you’re looking at this size. Note the B&H price is used, not new. 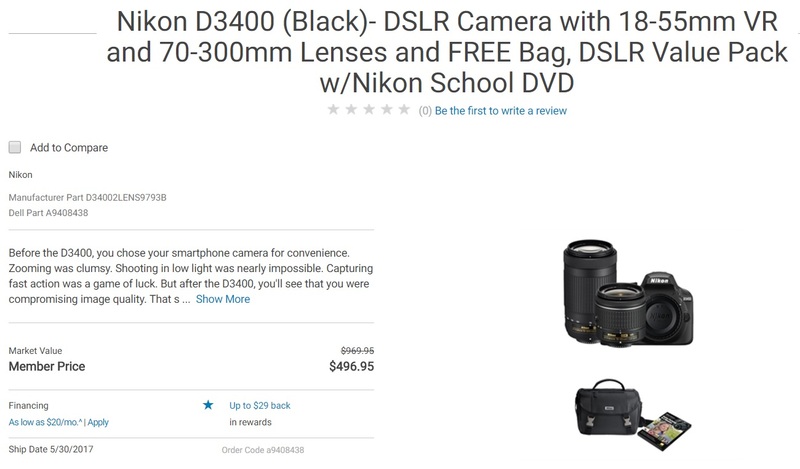 While the camera and lens combo has been sold refurbished for around $400 a number of times, this is a solid deal for a new bundle after cash back (not that I would hesitate to buy a refurb, either). On the other hand, if you’re looking for a professional camera body, you might find a deal as well. As just one example, this Canon EOS 5DS 50.6 MP body is available on Dell for $4,033.99. B&H even has some bundled freebies — though I doubt their value trumps your overall discount at Dell with cash back and price protection (if you’re concerned that price protection won’t work with the bundled freebies, choose another authorized dealers — most have this camera for $3499). If you are able to file a price protection claim successfully, you would then get another $500 back from your credit card. After price protection and cash back, you would end up out of pocket for $2,727.19 and you’d have $121 in Dell Rewards. That’s a great deal for this body new and from an authorized dealer (i.e. not grey market). Note that card issuers have limits as to price protection per claim and per year. For example, I believe that Citi limits price protection to $300 per claim — which means you couldn’t get the full price difference back in this case on a Citi card. Chase and Discover both limit you to $500 per claim (hence the math above based on $500 back). I haven’t pored through the terms to be sure that this camera would qualify — check your coverage before you buy. There are surely tons of other deals. I just picked two of the TVs bundled with gift cards. Twenty percent cash back would stack nicely with almost any of the bundle deals. You could surely do well on a laptop as well. Remember that Dell sells tablets, wearables, home theater equipment, and more. If you find something great, let us know in the comments. Great finds, Nick! Just wish I could ship some of those TVs over here to Europe! 😉 Love the Canon deal (my wife is a Canon shooter, I’m a Sony so she would like that one if she wasn’t already happy with her 5D MKIII). Thanks, Charlie! Wish I could help on the shipping to Europe :-). Dell has some Sony equipment, too — but I guess you’re in the same boat on getting it overseas! Hopefully they time a promo for your next trip back stateside. Avoid Befrugal. They closed my account and refuse to tell me why or to pay out the cash back I had on the account. Thanks for the report — TopCashBack also has 20% back today (Cashbackmonitor still showed 19% when I looked this AM, but I see it is actually 20%). On the flip side, I’ve been using BeFrugal for years and have cashed out many times without any issues. I’m sorry to hear that you had such a strange experience. One issue I did have with them in the beginning was that I had to verify by account by phone one time in the very beginning. They told me it would be a one-time-only thing and that was it. Otherwise, never had an issue. Here’s even a better deal with the LG 4K Ultra HD Smart Tvs. It’s available in 19/55/65 sizes and all are priced at $449.00 plus you get the $150 gift certificate. This brings the price to $449 – $150 gift certificate – $89.80 cash back rebate = $209.20 for a 65″ ultra HD smart TV. Are you sure about that Joe? No matter which size I select, it only adds the 49″ TV to my cart. It won’t add the 65″ to my cart. Double check your order/cart — did you get the 65″ or the 49″? Even the link you posted is indicating as 49. Please make sure that you’re getting 65 not 49. I needed the 49 and knew that when ordering. Thanks for the heads up. I haven’t tried this, so I’m not sure. I’ve bought a lot of TVs with GCs from Dell. Always gotten the CB. I’d give it a week or two before getting concerned. Oh great! Thanks for the DP. But topcashback usually tracked the transaction within 1-2days. Anyway, I will wait to see. So with the camera deal, I’m seeing Dell gift cards on sale at 6% off on Raise. Is it possible to buy the camera with gift cards and still get the cash back? Good question — but I don’t know the answer for sure. But here’s the thing: I wouldn’t risk losing 24% CB for the possible reward of 6% more unless the 18% spread was an insignificant amount of money to me. That’s something I’d run on a couple of $50 test purchases — I probably wouldn’t chance it on a camera where my cash back is in the hundreds of dollars and was the deciding factor in buying in the first place. All that said, there are a couple of success reports in the Laboratory from a couple of years ago (but go to the Laboratory and read the results — one didn’t track and the reporter had to submit a claim with the portal omitting the info that showed he paid with a gift card — seems like a risk to me, especially if you’re buying the 5DS….in which case, I’d also like the extended warranty protection of a CC).